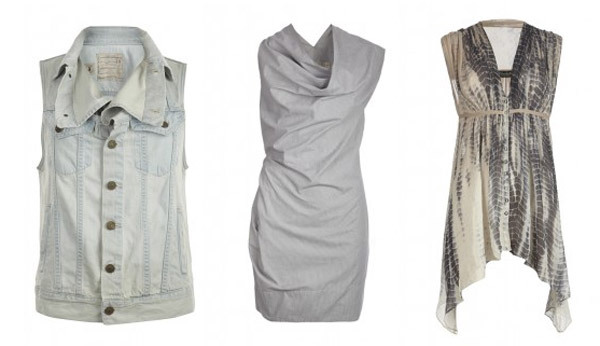 ALLSAINTS SPITALFIELDS Summer collection now available online! Deconstructed denim gilet, reworked using vintage denim jacket samples. The Kay denim gilet is made using bleached indigo denim with a dirty grey spray and features signature AllSaints rusty metalwork. 100% Italian cotton dress with a brushed hand feel and vintage inspired ticking stripe. The Urien dress was designed on the stand using tucking technqiues to create drape with deconstructed pouch pocket and asymmetric cowl neckline. Dusty Blue/Stone. 100% Cotton. Oversized kaftan made from tye dyed silk with a button down front and tie detailing under bust. The Porisan kaftan can be worn in different ways; tied at the side or left loose for a more oversized look. 100% Silk.